"Words cannot describe how amazing Meg is. We hired her to photograph our wedding and she went above and beyond and thought of everything. We received sneak peeks of some photos the day after our wedding and were blown away. She definitely exceeded even our best expectations"
"We loved working with Meg! She made us and our kids feel super comfortable, was great at directing, organized, and delivered our images quickly. I would definitely recommend her to anyone in search of an incredible and down to earth photographer." 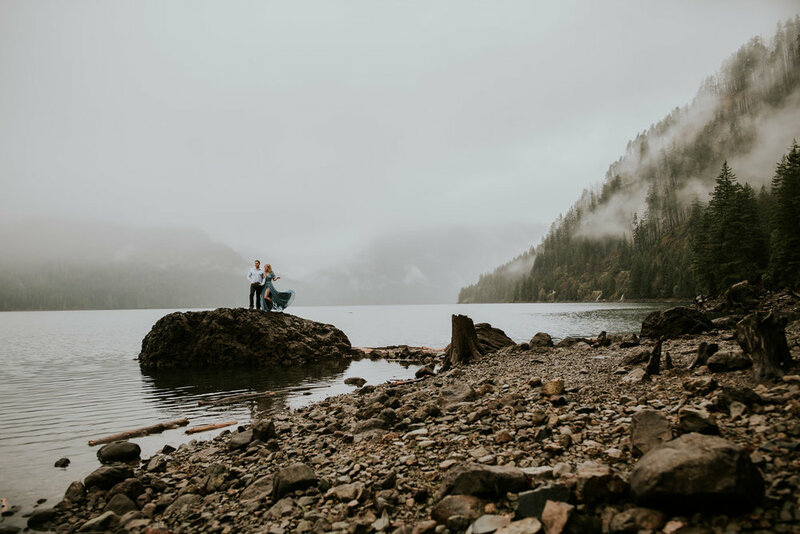 "FIRST we worked with Meg to capture our engagement photos - we hiked to one of the lakes at Mt. Rainier and she captured some truly incredible photos for us. But we just got our photos back tonight from our wedding and I can't stop looking at them! Not even long enough to go get my husband to show him!! Every time I find a favorite then the next one out does it. I can't even decide which ones to order for our family because there are so many beautiful ones to choose from!! Thank you SO much to Meg and her assistant Autumn for capturing such beautiful photos of our very unique - and probably a bit challenging - special day. These photos cement the feelings that we have in our memories by allowing us to revisit them every time we see them. Thank you so much!" "Wow.. I have no words to describe the way Meg captured our special day. She was kind, pure, honest, and the pictures speak for themselves. We hired her to fly out to Florida to photograph our wedding and throughout the whole process she was like a friend. She was so fun to be around and made sure we had all the pictures we could want to remember our day. Her prices were BEYOND fair for the work she put in. I could not be more happy with her work and how easy she was to communicate with. Thank you so much Meg- from the bottom of our hearts. You are amazing!!!!!!!" "We started looking for a newborn photographer a month or so before our daughter was born, and a mutual friend recommend Meg at BCI. After looking through some of her work we decided we’d love for Meg to capture some photos of our little babe. Meg had fantastic communication throughout the whole booking and planning process. We talked about our vision for the photos and she helped us decide the best place/outfits for the shoot. She was also very open about pricing and the content we’d be receiving- a huge bonus! Meg was so patient with Willa, our daughter, who seemed to be either awake or crying the majority of the shoot. The whole process was easy and enjoyable, and the photos she captured were amazing. We highly recommend Meg and BCI!" "Absolutely 100% recommend Meg and her company for any photos you need taken. My partner and I absolutely loved the quality of work Meg put in her photos! Not only did she exceed our expectations of photos she made our wedding run so much smoother! The photos are amazing and the masculinity you captured in our photos was everything we needed and more. THANK YOU so much for the amazing work you did on our special day. Can’t say that enough!" "Before we were even engaged, we were at a friend's house and saw absolutely stunning photos from their engagement hanging in their living room. When we asked who took them, they shared Meg's info. Flash forward to a month ago, we got engaged! And when we took a look at our priorities for where we knew we didn't want to spare any expense, our top pick was a photographer. I reached out to Meg two days after we got engaged, hoping and praying she would still be available for our wedding later this year. She replied to me within a few hours and from there, she has been an absolute pleasure and dream to work with. She's quick to respond and enthusiastic about making what you and your honey want a reality! She has been incredibly flexible as we do live in Washington state and rain is almost always going to happen. She gave me and my fiance ideas on what to wear and has kept us at ease thus far! We were both over the moon excited about our engagement shoot but were a little worried that the photos would be great but we'd look silly! From the moment we met Meg, our worries were put to rest. She knows exactly what she's doing and how to get great shots that truly reflect the love we have for one another. She's fun and engaging and we were laughing the entire time! She shared our engagement photo sneak peek with us and we were so ecstatic at how they turned out. And then! She quickly shared our entire engagement shoot album with us and I spent the entire day just looking at them in awe! I wish I could print them all out and hang them around our house, they're all my favorites! We are so excited and grateful to continue working with Meg for our wedding photos! We could not recommend her anymore highly. Thank you from the bottom of our hearts, Meg! " "From the moment we saw Meg's work there was no question in our mind who we wanted to shoot our February 2018 wedding. She is professional and her prompt response to questions was much appreciated. Meg is extremely talented and amazing to work with. She has a great eye for photography and did an outstanding job capturing the "little moments" between my husband and I. She helped create a fun and stress-free environment for our wedding day. Our day was truly the most magical day of our lives and Meg was able to capture those memories for us to have for a lifetime. Thank you Meg!" Meg with Back Country Imagery is the BEST. She has taken our maternity, our oldest daughter’s newborn and one-year/family, and our younger daughter’s newborn/family and we were 100% in love with all of them. She is easy to work with and makes you feel comfortable during the photo shoots. She is GREAT with newborns. She has taken both indoor and outdoor photos for us and they’ve been amazing. She is easy to communicate with, flexible, affordable, and timely. She listens to her client’s wants (and makes them happen!) and also suggests her own professional ideas. I honestly couldn’t ask for anything more in a photographer. We absolutely love Meg and are so in love with the memories she has captured for us. We will continue to use her as our photographer again and again!!" "The first thing we planned and picked out was our photographer, Meg was everything we dreamed of. Her work is breathtaking, she knows exactly what shes doing and captures every special moment so quickly and perfectly. I never imagined we could find someone so talented! Shes much more than just a photographer, she goes the extra mile her love and passion for her work truly shows in all her photos.She does her research she ventures off into the woods and gets dirty, mud, bugs just to get those photos that everyone loves. Meg is flexible we even moved our wedding date to ensure we had her photograph our big day this June! I cannot say enough amazing things about Meg." "Meg is amazing and I would recommend her to anyone looking for a great photographer. I was super nervous about finding the perfect photographer for our wedding, but I couldn't feel more blessed that we chose Back Country Imagery. Meg was accommodating and helped me structure my timeline and even came out to the venue beforehand to help us select the best place for the altar and gave us great pointers regarding comfort of our guests. On the wedding day, Meg guided us flawlessly and was super flexible when we got derailed from our timeline, but also made sure we didn't miss out on the best photo opportunities. She made sure to capture all the photo ideas that I absolutely had to have and they will forever be our most precious moments. We are very shy and I am especially insecure in front of camera, but Meg brought out the best in us and I felt beautiful in the moments she captured. We loved her so much, that we flew her out on our honeymoon for a "trash the dress" session which was even more magical and super fun. I feel like Meg went above and beyond for us and I am truly grateful! Meg is incredibly easy to be around with her down to earth, fun, and sarcastically entertaining demeanor. I felt like we were friends at the end of it all." "I cannot say enough great things about Meg and backcountryimagery!! Other than her pictures being absolutely amazing, she has such a bubbly personality and is very easy to be around. I was super nervous for my senior pictures just because I'm not too comfortable around a camera, but she really helps you feel confident and tells you how to pose! Highly recommend backcountryimagery!!! :)) "
"When I first got engaged I was struggling to find a photographer who doesn’t do the basic wedding photos. I wanted someone that has a fresh eye and was creative. Meg was the most amazing photographer I could have ever found. Not only did she do my engagement photos but everyone is starry eyed over the wedding photos. She is awesome to work with and will text you back instantly! And for a crazy bride she made the process go so easily. I have recommended 2 of my friends to her and they have chosen her for their weddings. Honestly Back Country Imagery is the way to go! Look no further Meg is here to make all your wedding photo dreams come true." "I searched sooo many photographers, and when I found meg, I knew I just wanted to have her as our photographer. Her pictures are amazing, the chemistry, Love, emotion, color, backgrounds , are all so exquisite. To top her beautiful pictures, she's a beautiful person inside and out! She was so helpful making what felt like an award experience fun and so exciting. I'm not one who likes having my picture taken and she made our engagement and wedding photos, some of the best memories we have to hold onto. I am IN LOVE with so many of our photo's, and I didn't even know it was possible to love a moment in time like that. If you're on the fence, and you're looking for someone to capture you and your family or spouse for pictures, I couldn't recommend meg more. I look forward to anniversary, and future family pictures, with meg as our photographer:)"